I’ve just released an update to Class 3 Outbreak to add support for the ‘get to a building’ objective! 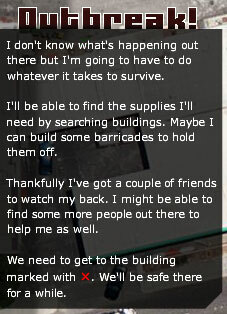 The player has to get all of their survivors into a building chosen by the map author. 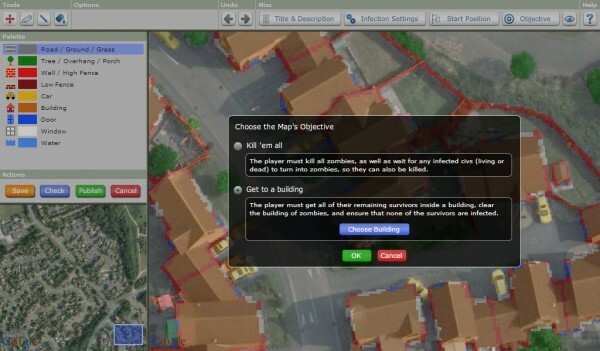 Once you’ve selected a building, you can close down the Objective dialog. Then you’ll need to save and re-publish your map. When buildings are next to each other it can sometimes be difficult to tell where the boundary is between buildings. And if the map author has created rooms inside the buildings, it is usually impossible to tell where the walls are between rooms, unless you turn on the Show Buildings button. 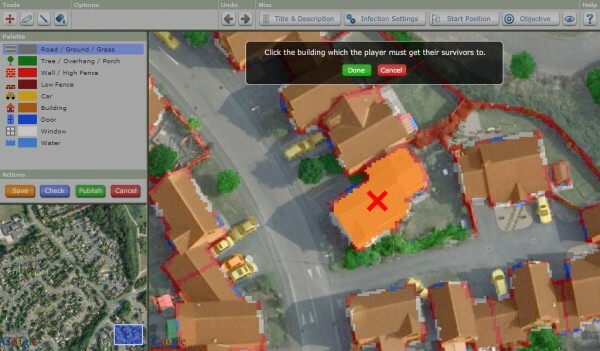 So to make it clear exactly where the building is which you need to get your survivors into, the building is also highlighted in brown. The goal of getting to the building is to be ‘safe’ – so it’s not much use if there are zombies roaming around inside the building! Therefore even once you have all of your infection-free survivors inside the building, you also need to clear the building of zombies before the game will end. To make it easier to keep track of how you’re going with all of the above conditions, if at least one of your survivors is in the target building then the stats at the top-left are updated to display your progress. In this update I’ve also modified the fog of war a bit. Now at the start of the game you can see the entire map as if you’d already visited everywhere. So now the fog just hides the zombies/civs outside of your field of view. I made this change so that you could see the building that you’re supposed to get to! Now that this objective is done, I’ll be moving on to adding the third objective – which is to rescue a person who starts the game inside a locked building. can u make that a textbox apear until the map is finished? For now the maps have their description, which appears at the bottom of the page when you play the map. But some other people have suggested adding the ability to customize the text displayed on the left at the start of the game (so you can describe the context of the objective), so I’m thinking I’ll add that at some point. And so adding some text for the end of the map could be an extension of that, too. In the future I’d like to add the ability for people to create campaigns of multiple maps – so when you beat the objective of one map, then you’ll be able to go to the next map in the campaign. So I think that would be better than adding a link to the ‘next’ map into the end-of-game text. btw. if i would be you, i would make the donation button a little bigger. i am knowing your game for a couple of years now. and i had to search for it to get sure that he is there. sry for my bad english , im Thai. 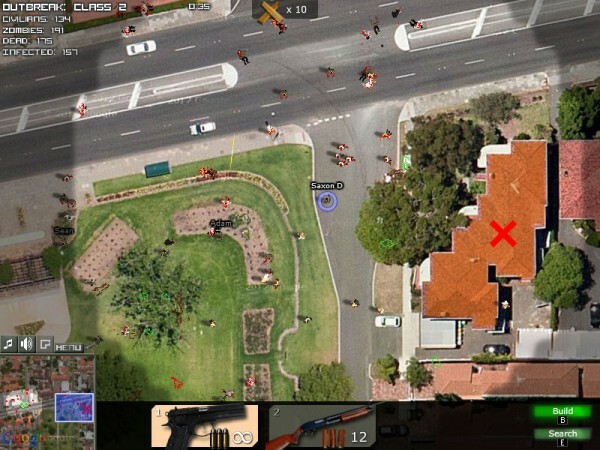 The game is built using Flash (Flex and ActionScript), with the Google Maps API for Flash. However I wouldn’t recommend using that, as Google are going to retire it in September 2014. Great update Saxon, But, I shall ask, which maps have this function?